The photo shows my Xtracycle with Kick-Back stand relaxing in the sun, and remaining upright with 80 kg in the panniers and front basket. Emigrating is difficult. Setting up a business is difficult. Learning a language is difficult. Doing all these things just at the time that a global recession starts to bite is extra difficult. As a result, I've been doing a part time job delivering mail in order to earn a bit more money. The Xtracycle is the bike I've been using for this. Unfortunately, my Xtracycle is one of the very early ones which had a weak point in the design at the point where the standard kick stand attaches. This broke off, leaving me without a kick stand. That was OK for trips between home and the post office or shops, both of which places have good quality wheel supporting racks which would keep the bike upright as I loaded it. However, it was a complete non-starter for a delivery job which involved standing the bike outside hundreds of homes each day. In any case, the standard kick stand on the Xtracycle simply wasn't designed to keep the sort of weight we're dealing with upright. I looked around for solutions and came across the Xtracycle Kick-Back. This is a specially made stand which fits into the tubing at the front of the Xtracycle. You can see the parts which come in the box on the right. Everything you need to fit it is supplied. As my FreeRadical is a very early production example it didn't have the holes required for the spring loaded clips also used by other accessories such as the wideloader. More modern FreeRadicals won't need this extra step of drilling holes. In fact for most people it is a very quick job to install the stand. The only tools you will need are a screwdriver for doing up the screw which holds a stretchy cord to the rear stay - this is what provides the force to make the stand spring up - and a 5 mm allen key for adjusting the height of the stand. You want it so that it just forces one wheel off the ground when the bike is standing. If it is too high then you will find it is a considerable effort to park your bike. I found I also needed to cut a couple of centimetres off the length of the black inserts for the stand in order that I could have the stand at a low enough height. I also recommend using copper grease when these are inserted. I ride in all weathers and without it the parts would seize in place. And there you have it. The bike can now stand. It's a very good product. The only one of its kind made especially for the Xtracycle, and I have found it to work extremely well. It's been fitted since January 13th. That may not seem such a long time, but my bike computer tells me that I've covered over 500 km with the delivery schedule since then, and used the stand many thousands of times. Combined with a trailer, I've used the bike to haul as much as 225 kg ( about 500 lb ) of mail at once. It was as struggle to ride up the slightest of inclines, but the bike didn't fall over when I stopped. If you want a stand which really works with your Xtracycle, this is the only one available which is specifically designed to do the job. It works extremely well and I suggest not bothering to consider any alternatives. It is Available here from BikeTrailerShop.com. We now use our Xtracycle. with the Kick-Back, to make deliveries for our webshop. The bike has had several more upgrades since this article was written, and they're detailed in another blog post. The Xtracycle is not the best tool for all jobs, but it does do what it does extremely well. I've lots more details of the Xtracycle on my web page about it. The front racks are here. Another view of my commute, showing some of the other people cycling at the same time. There are always quite a few, and they cause a bit of a traffic jam on the cycle path sometimes. Finally I managed an average of over 32 km/h (20 mph) in both directions, on the same day as I made the video with the open bridge. Since then I've done it even quicker again in a borrowed velomobile. How often do cycling campaigners get told that providing decent infrastructure for cyclists is "too expensive" ? Or that it's simply a waste of money ? 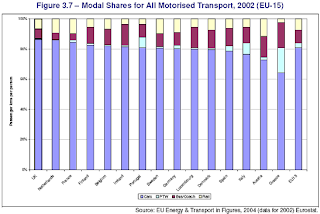 In many countries cycling gets a pittance compared with other modes of transport. There is clearly a lot of muddled thinking going on. Cycling is not a problem, but is part of the solution so far as reducing dependency on foreign oil, improving people's health (which makes companies more profitable) and leads to a happier society. What's more, encouraging cycling simply makes good financial sense. A few weeks ago I came across a graph showing the "Current Account Balance" (it's explained at that link) of various different countries. It actually explains itself as "a country's net trade in goods and services, plus net earnings from rents, interest, profits, and dividends, and net transfer payments (such as pension funds and worker remittances) to and from the rest of the world during the period specified." Green shows a positive balance, red shows a negative balance, or rate of increase in debt. The length of the line shows the size of this trade balance. Let's look down the list of the top ten nations. China of course gains its wealth these days due to its incredible level of exports of manufactured goods. It is famous for having a lot of bikes (though sadly cycle usage is dropping), Japan also has a lot more cycling than average. Germany has around 10% of journeys by bike. Saudi Arabia and Russia have oil and gas. Switzerland has about 6% of journeys despite being a mountainous country. The Netherlands has around 27% of all journeys by bike, and leads the world. Norway earns its position in the list due to being an oil exporting country as only 4% of trips are by bicycle there, Kuwait also has oil, and Singapore is another big trading nation with high public transport use. Now let's consider the three countries which come in behind the Netherlands for the cycling rate. Denmark, where 18% of all journeys by bike, has a small population so is disadvantaged for a position in this list but is still positive at position 38, Similarly Finland and Sweden take 3rd and 4th place for cycling with 11% and 10%, and both of these are also positive. So, the top four countries for cycling are all in the green, doing well financially, and they also have good social policies. If we look at the other end of the scale, the countries with the fastest growing debts, we find this collection. Not one country at this end of the chart has a high cycling rate. The USA, UK and Australia have amongst the lowest cycling rates in the world at around 1% of journeys. Italy and France are at 3%. Perhaps the worst position of a country with a reasonably high rate of cycling is India at 11th from bottom. However, that is a country where cycling is associated with poverty and people cycle predominantly because the have to. Mind you, they're still doing better than the bottom ten are. Of course, correlation isn't causation. I'm not saying that these countries are at this end of the list purely because people who live there are reluctant to cycle. However, it is perhaps interesting to reflect upon the way that the Dutch sometimes refer to their cycling policy as a fiscal measure. Getting people to cycle means spending less on road maintenance, less on imported oil, less on fixing diseases which are caused by a sedentary lifestyle and makes workers more productive. I've mentioned it before, but the top four countries for cycling, all of whom have positive balances in this comparison, are also the top four for childhood happiness. Is it not worth trying to copy such a success ? The image shows a page out of a special offers leaflet from one of the chain stores in the Netherlands this week. Mostly they sell toothpaste, soap, nappies. In the UK a near equivalent might be "Boots" (the chemist). However this week there are also some special matching accessories for the person and bicycle. You can buy a matching belt, umbrella (useful for cycling in the rain), sun-glass holder (at the same time as an umbrella...), cycle saddle cover, panniers and removable bag for your bike basket. A few other items are on previous pages. That's cycling as a natural thing for anyone to be doing. No sense of danger, no protective gear, just matching accessories to look trendy on your bike. We've had a couple of serious posts this week, so here's something different. Two very different videos including bicycle bells, courtesy of Jchico1021 and sixd0ts. "The Power of the Bicycle Bell" and "Bicycle Bell Mayhem from Amsterdam". A range of bells, complete with sound samples, can be heard, viewed and bought in our online shop. It's a rhetorical question - of course they do. However, it does not always look much like it. Today I read in the Cambridge Evening News about how following a crash which involved two children going to school in Cambridgeshire on a dangerous road, a school bus has been laid on for others with the same route. However, this has resulted in the bus being withdrawn for another 57 children and they will have to make a similarly dangerous journey by other means. The truly absurd thing about this is that the distances involved are so short. Sawston to Great Shelford was my commute for nearly two years when I lived in that area. It's a distance of under three miles ( 5 km ). These children should all be able to cycle that distance, and this is where they are really being let down. Why is it that British people put up with conditions on their roads which put their children in danger ? And as cycling campaigners, where exactly do we expect the next generation of cyclists to come from if children can't ride their bikes such a short distance to school in safety ? It's a societal problem, not just a cycling problem. And it's not the only societal problem that Britain faces. The UK has the second highest rate of teenage pregnancy in Europe (the USA has a rate much higher again), a high rate of drug abuse, a knife crime problem, a problem with out of control teens, and the highest rate of binge drinking in Europe. There is a relationship between the policies which make for safe cycling and the social policies which lead to a happy childhood. The top four countries for cycling are also the top four for childhood happiness. Compare the experiences of British children with those of Dutch children. Whether you are British or not, how does your country measure up ? What are your roads for ? Because the Dutch love their children, they campaigned for them. A 98% reduction in child road deaths has been achieved in the Netherlands. My rhetorical question received an answer three years after this article was written. A similar story came up a few months back. If the question in the title sounds vaguely familiar, that's perhaps because it's similar to the one posed in this 1980s pop song. Groningen in the North of the Netherlands, just 30 km north from where we live, has the highest rate of cycling in the world. Nearly 60% of all journeys are made by bicycle in the city. These three slides from a presentation given on the 2008 study tours and previously at the 2006 European conference on Mobility Management by Mr Cor van der Klaauw. In 1964 the city was small. There were no restrictions on cars being driven through the centre of the city and there were few main cycle routes. The motorist was king at this time. In some locations in the Netherlands in the 1950s and 1960s, cycle paths were removed in order to make more space for cars. were built before policy changed. 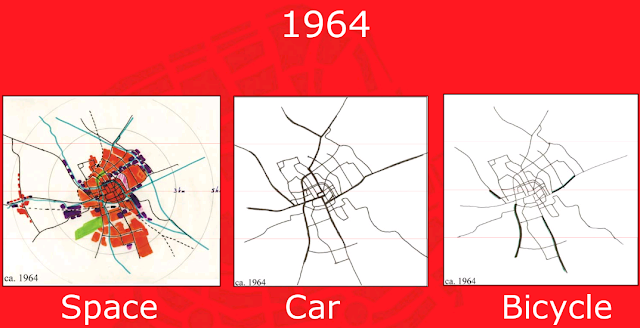 In Groningen, just as in other cities across the world, the 1960s brought planning and building of motorways right into the city itself (west to east and to the south in the next map). A few of these large roads were built in Groningen. Notably the motorway which leads from the South and also access to the North, West and East. However, in 1972 a new local government changed the emphasis of planning in Groningen. The centre of the city was to be considered as the "living room" and town planning was integrated with transport policy. 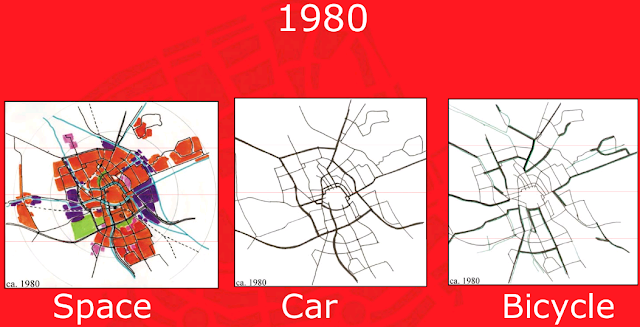 The city was to be designed to be compact. By 1980 the city had grown considerably with a lot of new housing around the outskirts. There was a ring road around the centre of the city, but access to the centre by car had been reduced. Many more high quality cycle routes had been created. 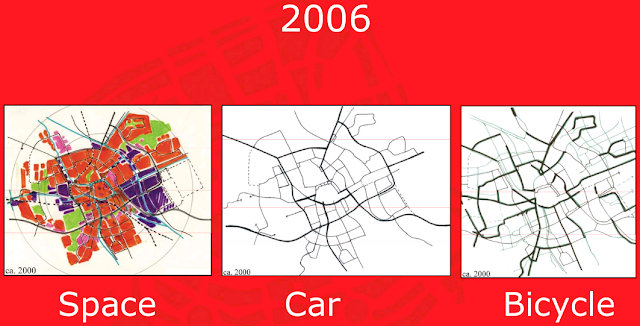 In 2006 the city has grown rather more, and cars pushed out further from the city centre. The city is now split into four segments between which it is impossible to drive without going out to the ring-road and back in again. There are many more cycle routes than before. I should note that there is nothing stopping you cycling through the centre these days. The last few minutes of one of my videos shows the centre by bike. However, it isn't designated as a main cycling route. It is impossible to drive through, though, as the only way out by car is the way you came in, and many streets are entirely closed to private cars. Groningen has 84000 homes, 38% of which were built after 1970. 180000 people live in those homes, and they own 71000 cars and 300000 bicycles. 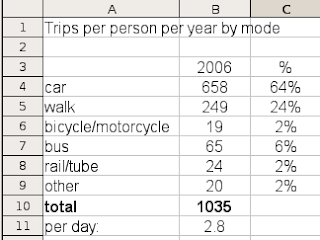 There are 0.4 cars and 1.7 bikes per person. Seventy eight percent of residents now live within 3 km of the city centre. 90% of employees live within 3 km of the city centre. These short distances of course help to make cycling a viable mode of transport for most journeys, but we should note that Groningen is actually not particularly densely populated by world standards. In fact, Groningen is far less densely populated than many cities in other countries with less cycling. There are an average of 1.4 bicycle trips per person per day in the city, making up 59% of the total journeys, vs. under 37% by car. The average speed for driving within the city is 9.6 km/h, the average speed for cycling is 14.2 km/h. The cycling figure may seem slow, but note that it refers to whole journey average speed, not peak speed sprinting between lights. It also reflects the wide demographics of the cyclists. Fast Groningen cyclists travel appreciably quicker than this, but drivers can do little to increase their speed. It isn't only Groningen which has followed such policies. Most, if not all, Dutch cities have done this to an extent. For instance, Assen also has a car free town centre, as does Nijmegen. In summary, it is quite possible to grow cycling so that it accounts for more journeys than any other mode within a city. However, it does take a helping hand. Groningen's achievement came from policy to exclude cars from the centre of the city (a form of segregation without cycle paths), and to provide high quality and mostly traffic free cycling routes from the outskirts to the centre. Also bear in mind that Groningen has the lowest average age of any city in the Netherlands and a high population of students (approximately 50000 in a city of 180000 people). This factor of course also boosts the level of cycling. However, due to the design of the city, even students in Groningen tend to cycle more than students anywhere else. 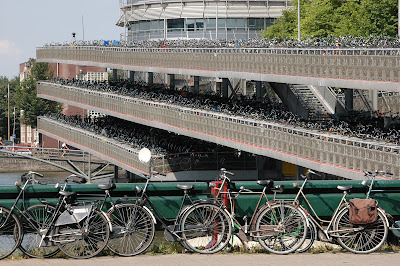 There are quite a few other posts about Groningen, including the huge railway station cycle park, an extraordinary bridge, how congestion on busy cycle-paths is avoided by providing other routes and how despite all this, the city still didn't manage to win the "Cycling City of the Netherlands" competition in 2011. See this for yourself and have what you are looking at put in context for you and explained by a native English speaker. Book a study tour. Note that it is not entirely clear what the 59% figure for cycling actually means. Who was counted ? Only residents or also people who travel from outside the city ? What methodology led to this result ? Clearly some people are excluded as pedestrians do not appear to have been counted when walking could possibly account for anything up to a fifth of total journeys made in the city (as is the case in Amsterdam) then this would reduce the cycling percentage to around 50% and driving to around 30%. We should always be skeptical of figures which are presented in a promotional way as most figures presented all around the world on cycling are not reliable. Exaggeration of cycling modal shares is extremely common around the whole world. The lowest figure we've seen quoted for Groningen comes from the possibly more authoritative Fietsberaad Cycling in the Netherlands publication. This states that the cycling modal share for Groningen is 38%, though they also don't tell us exactly how they came to that figure. Today I started a part time job at the ligfietsgarage in Groningen, helping with making Mango velomobiles. I had planned to cycle there, but as it was snowing this morning so I decided to take my folding bike on the train instead. This is not as effective as you might think. It shortened the cycle to 22 km instead of 63 km (13.5 miles vs. 39 miles), but the folding bike goes at half the speed and waiting around for the train meant it took over an hour each way - longer than cycling the lot would have done. I'm hoping for better weather next Tuesday. Perhaps at some point I'll be able to afford my own velomobile and be both out of the weather and faster. The video is from last Friday morning when it wasn't snowing and I cycled up to have a chat. Note the wonderful cycle paths almost the entire way, on which your speed isn't restricted by anything but your fitness. It's reminiscent of riding on a velodrome (the ultimate segregated cycle facility for those who want to cycle at speed). On a good day I can do it in less than an hour in each direction. With a tailwind it can be very quick indeed. However, there are also those bad days when there is a strong headwind in both directions. There are also other posts about commuters, The Assen-Groningen Route, directness and featuring recumbents. A few months back I made a video about a journey in the opposite direction from Assen. One of the problems that occurs when all children cycle to school is that they tend to drop litter. Here's a solution to the problem: a "blikvanger" or "can catcher". On routes used by a lot of children to get to school you find these litter bins for cyclists to throw their litter into without stopping. 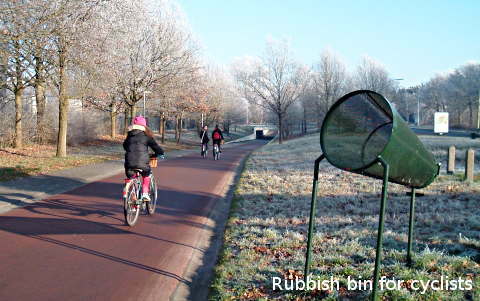 This is an older style cyclists rubbish bin, using a net instead of a metal cone, on a route north of Assen. The opening is about a metre wide, and the cycle path is 2.5 m wide. It's on a popular rural school route. You may have seen the first photo before. It comes from our page of photos of Dutch cycling infrastructure. It also features on our article about how waste and recycling is dealt with in the Netherlands. Update November 2009: This short piece in the local news paper about publicity surrounding an anti-litter campaign shows the size of these bins. The openings are a metre in diameter, so that even those with not such a good aim can get their litter into the bin while moving. If you're going to copy this initiative for your own city, you need to get the scale right ! This is one of those small things that makes a difference for cyclists. The bin in the first photo can also be seen on Google Maps Streetview and it features in a video about school cycling in winter. This morning I went for another ride with the huneliggers. It was a bit chilly when I got up, but it wasn't so bad when I set off. Just -1 C / 30 F in the morning when I left, and it warmed up a few degrees in the sun during the morning. In the photo above, the ditches on both sides contain frozen water. We met at the usual place, and for me the total came to 70 km today. Stopped for lunch at a beautiful spot by a lake, and I practised my still not terribly useful Dutch. There's a video below giving a bit of a flavour of the ride. Could it perhaps be a slight over-reaction to describe two people riding on a bike at the same time as being "like suicide and murder" ? I've just returned home and cycled past a couple of schools here around lunch time and saw any number of children being given lifts on the back of their friend's bikes. Lots of smiles from friends enjoying their lives together. No concerns about it being unsafe. Given that cyclists here have the lowest death rate in the world, it would seem that this isn't a great problem. 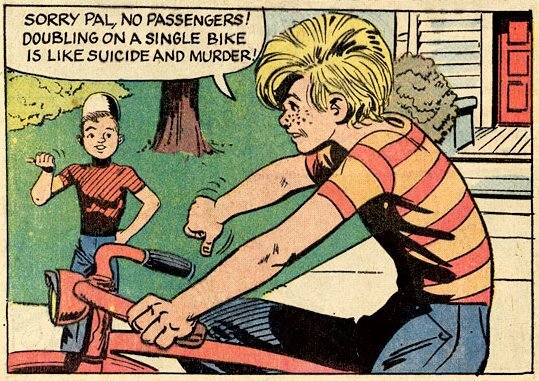 The image comes from a comic called "Danny and the Demoncycle" which was produced by the "Highway safety division of Virginia" back in 1972. This would seem to pre-date many of the current health and safety concerns over cycling, so unlike a modern day equivalent it doesn't also go on about helmets and fluorescent clothing. It's one of many examples of where excessive concern about something which carries a very small risk is mis-directed. In this case, it's likely to stop children cycling at all, with all the negative effects that this implies for health, wealth, and society. Real safety doesn't come from scaring people off bicycles. It comes from efforts to improve the conditions on the streets. I wonder if the same department also tried to stop people from driving cars. After all, they were responsible for roughly as many deaths in the last century as wars, yet the motor industry has always been keen to emphasize safety. Thanks to the Old Bike Blog for drawing my attention to this. But remember... "Sorry Pal, No passengers ! Doubling on a single bike is like suicide and murder !" Oh, and remember that carrying a passenger is actually illegal in many countries. Haven't the police got anything better to do ? A few days ago I posted a story about Mark Wagenbuur's 50 km long intermodal commute between 's-Hertogenbosch and Utrecht. I've just been sent a link to a further video of Mark's. This one presents a set of stills which document his journey on a day in 2005 when the Dutch railways were on strike and he cycled the 100 km round trip to work. He says: "I found it a very nice route. But it was a one time thing. I rode back the same day and if you are used to under 5km trips only that 100km on one day was a bit much!" The cycle facilities here support any speed that you like to ride. It's a network which covers the entire country. The paths vary in intent and there is always a choice. The direct route may be in a relatively unpleasant place such as next to a motorway, but you'll never be on the motorway and in any case that is never the only option. A little while ago we also featured a similar length route between Amsterdam and Utrecht. Where child cyclists cross a bus-road near their school, it is the cycle-path which very obviously has priority. 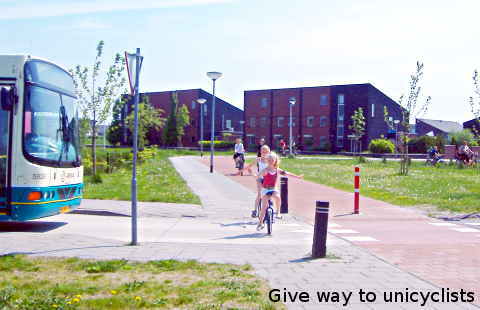 The children shown in the photo are unicycling to a primary school here in Assen, unattended by any adults. They're riding on the sidewalk alongside a bicycle path which provides the direct route to this school. It's perfectly safe to let children do this sort of thing here. The cycle-path provides priority for the children, including here where th cycle-path has priority over a road built specifically for buses. There is another view of the same school, including a very short glimpse of a child with a unicycle, in my now quite famous video of children riding to school. Lots of children here seem to know how to ride unicycles and it's not all that uncommon to see them going somewhere on them. The presenter says how "there are 500000 normal cyclists in Amsterdam, and one on a unicycle. He is joined by a peleton of other cyclists on the way to school. He is without bell, brakes, lights, steering but the police can't do anything about it." This rider was 16 when the film was made, so he'll be 69 this year. I'd like to think he is still be riding that unicycle. Note how he rides through something I've commented on before: an older Amsterdam which lacks cycle paths. It is sometimes assumed by people from other countries that the Netherlands has always been as it is now, but that is not true. There is a continual process of improvements for cyclists.